A Yosemite in GTA San Andreas. 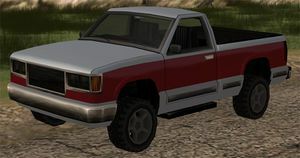 The Yosemite (pronounced yo-sem-ite) is a full-size pickup truck featured in Grand Theft Auto: San Andreas. The Yosemite is evidently a full-size pickup truck larger in size than Bobcat, resembling a heavy-duty version of a 1988-1999 GMC Sierra full size pickup (but missing a pair of headlights); its two-tone color schemes seem inspired by most early 1980s pickups. The PS2 and Xbox version also has a twin-rear axle tire configuration, while the PC version does not. The truck is presumably named after the Yosemite National Park in California, referencing the GMC Sierra's name in relation to the Sierra Nevada. Based on the vehicle's internal statistics, the Yosemite possess superior qualities over most other pickup trucks, with good speed, acceleration, and handling; these attributes were also tested by Rockstar to ascertain the vehicle's performance. In practice, however, the Yosemite is revealed to be one of the heaviest pickup trucks in the game, resulting in severe understeer, less responsive brakes and sluggish acceleration, but still manages to achieve above average top speeds at straightaways. The truck may be useful for off-roading due to its high ground clearance, but its stiff suspension may also prove to be a problem when traversing rough terrain. The monsterb variant of the Monster in GTA San Andreas is based on the Yosemite. The default radio station in the Yosemite is K-DST. The Yosemite is one of the few vehicles which cannot be modified. As mentioned above, the Xbox/PS2 version features a twin rear axle setup, however the PC version features a single set of wheels instead, this applies as well to the Linerunner, Tanker, and the Roadtrain. The Yosemite can be found almost anywhere in San Andreas. This page was last modified on 28 October 2013, at 20:47.